This email was sent out March 16 to people who have taken part in the Vancouver Consultation process. We invite all Christians in the city to participate in One City, One Message. It’s time to begin planning how you and your congregation will participate in One City, One Message on Sunday, June 11th. If you aren’t a pastor, tell your church leadership about it. You’ll recall that the idea for One City, One Message came as a friendly but passionate challenge from Vancouver City Councilor Andrea Reimer during the panel discussion among civic leaders at the City Summit last November. 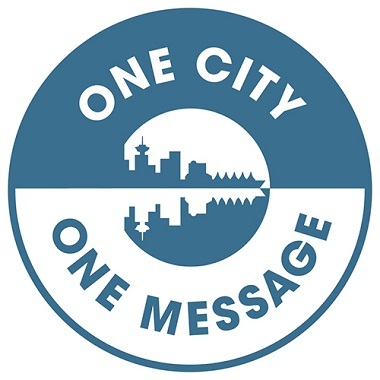 Taking a cue from the Vancouver Public Library’s longstanding annual initiative ‘One City, One Book,’ she encouraged us to use our moral authority to catalyze public conversations that matter by promoting an agreed-upon topic in our various congregations one Sunday each year. Welcoming the Stranger is a timely theme: research by the Vancouver Foundation in 2012 revealed that Vancouverites are experiencing a crisis of social isolation. Catholics will hear resonance with the Archdiocese’s strategic priority (#1B) of “Welcome Like We Mean It.” Pastors following the lectionary will note June 11th is Trinity Sunday. The topic of divine hospitality can go in many different directions – from settling refugees to sheltering the homeless to befriending the isolated elderly to peacemaking and reconciliation. get creative with your congregation’s already well-developed gift of divine hospitality or use the time to brainstorm together how to get better at it. In the meantime, we would love to hear – and share – stories about how your community is welcoming the stranger. Email them to us or post to social media with the hashtag #iwasastrangerYVR. A PDF poster will be available by April 30th to insert into bulletins, post in your church, or distribute in your community. Keep an eye on ChurchForVancouver.ca for stories and VancouverConsultation.com for additional resources. We hope this theme of Welcoming the Stranger will echo in dozens – maybe hundreds – of churches, and that it will be heard loud and clear throughout Metro Vancouver. So kindly circulate this email to all your colleagues. We welcome your questions and comments. And, please, let us know if you’re planning to participate. 1. This portion did not accompany the letter. ← Around Town: Santa Ono, José Figueroa, TWU Spartans volleyball champs . . .